A tactical trick-taking card game for 3 to 4 players. It is the sixth century BC. Tensions are high amongst the city-states of ancient Greece. War is eminent. You are a military leader and it is your duty to assemble a “phalanx” – a mass military formation composed entirely of heavy infantry. To recruit only the strongest and most able-bodies soldiers, you attend skirmishes and send forth your best possible candidates to fight others in the land. The winner of the skirmish selects who joins their phalanx. However, be aware that your candidate may betray your city-state to join another, but by the same token you can lure your opponent as well. Also, there is a penalty for taking on too many as your city-state can only afford so many soldiers. The military leader with the strongest phalanx wins! A challenging cooperative strategy game for 4-6 players. The Abbey is a cooperative strategy game where players take on the roles of Monks and Nuns in a medieval Irish monastery under siege by Viking Northmen. Together you must convert the northerners or face a grizzly doom. This game is based off the movie "The Secret of Kells", and the historical book, "How the Irish Saved Civilization". This is intended to be a difficult cooperative game where tribulation builds to a point where your team collapses or victory is won. The world is doomed. You are probably all going to die. Fortunately, the portal to the temporal library has opened. You are part of the crack team that will be sent through the portal to find the records room, figure out what humanity will have done to avert disaster, then take the return portal to implement the plan. Time library is a semi-cooperative, music making, maze exploration game. Players start out on the same team, but its possible only some of them will make it out of the library. Players should feel free to bring instruments or objects they've got lying around that make cool sounds. I will bring a box of found objects for players who don't have their own. At a secret facility at an undisclosed location lurks the Department of Irradiation*, the top-secret government department responsible for irradiating whatever the government wants irradiated. And as employees of the Department of Irradiation, players will compete to irradiate the items that will give them the most recognition in the eyes of their shadowy superiors. In layman's terms, you get to zap stuff for points. You'll collect a hand of cards representing different quantities and wavelengths of radiation, then cash in those cards to complete projects that will add to your score. In your race to collect points, you'll probably have to over-irradiate some projects, which is perfectly legal, but any extra radiation will get absorbed by your precious little self. At the end of the game, death--or at least a scoring penalty--awaits whichever of you glows the brightest, and the living player with the most points gets rewarded with the victory. *I totally stole this concept from the webcomic "Skin Horse" by Jeffrey Channing Wells and Shaenon Garrity. A game of exploration for 3-4 players. Since the days of Cartier and Hudson, explorers had sought to find a sea route from the Atlantic to the Pacific around North America, the fabled Northwest Passage. But by the end of the Napoleonic Wars in 1815, the northern parts of America were still largely unknown. The British Admiralty, seeking to occupy its underemployed naval officers, embarked on a new program of exploration. Over the next fifty years, the quest to find the Northwest Passage became a matter of national pride. Parliament offered prizes for the first explorer to complete the passage or even to reach the halfway point, and dozens of expeditions braved the relentless cold and ice. In this game, you take the role of an explorer seeking the glory of discovering the elusive Northwest Passage. Will you have enough supplies and morale to win through, or will your expedition vanish into the icy waste? A Frenetic Co-op for 4-8 players. Real-time cooperative game about running a restaurant. Base version seats four players: Maitre D', Chef, Waiter, and Bus Boy. Expanded version adds 4-5 more roles: Sous Chef, Assistant Waiter, Pastry Chef, WIne Sommelier, and Bread Chef. Frenetic and fun! A fantasy adventure card game for 2-5 players. 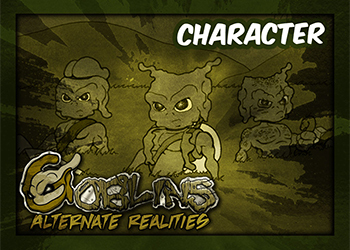 Goblins: Alternate Realities is a fantasy adventure card game based upon the popular webcomic Goblins. In one of the many alternate realities of Goblins, friends have become enemies, the dead mourn the living and all the iconic characters of Goblins now find themselves allied in completely unpredictable ways. As the leader of an alternate adventuring party, you direct your fellow party members through a series of challenges in a race against rival parties to complete your character's quests. As each party advances from one challenge location to the next, the party has the opportunity to claim treasure, enlist allies and gain levels. But, they may also cross paths with members of other parties, leading to the potential for some very explosive battles. Goblins: Alternate Realities is a questing card fest for 2 to 5 players in the universe of Goblins. The world is full of dark and menacing things that need to be contained: from aliens to vampires, dragons to zombie bears, chupacabras to were-goats. Your plan is to capture them and, later, to sell tickets. Roll dice to hunt monsters. A word game for 3-6 players. How is a crayfish like a monogram? What does stucco have in common with tweezers? Find out in this card game of word connections. Dutch auctions in 1st century Palestine. Exploration/Pick up and deliver for 4 players. A game where players face off in a race to collect life forms and resources from space. This Sci-Fi game is played with triangular tiles that are placed on each player’s turn, and small ships that are maneuvered through space. Often this is a game of “TAKE THAT!” where players try to block and slow down other players from winning. A card game for 3-6 players. You'll have to come and see if this turns out to be just what it sounds like. Co-op game with a growing traitor element. A sort of trading game that works well even with just 2 players. Behind large or loose organizations are the old men that shape global policy. They may have differing opinions but must work together to pass judgement and create events. This game represents these old men negotiating with each other over a changing global landscape. Players will balance political influence, social support for issues, and world economies as they try to grow their own power. This is obviously a negotiation heavy game, with randomness in the available directions to loin the world. Players will pass 10 global policies and then score who has the most influence. Edward Lindsey: adventurer, big game hunter, and hit with the ladies. As fellow adventurers dining with Sir Lindsey with you will recall and tell some of his most memorable stories. The drinks might make your memory a bit fuzzy, but as long as you're the first to remember three complete stories you'll win! Whether that gets you another round of drinks, well, that depends on your friends. In this light card game, you'll assemble the elements of a tale of adventure and tell it to the others. But as time goes by, your memory will get hazier and by the time you have three stories played, well, let's hope you can remember them. A commodity speculation and auction game using the Decktet, based on rules by Adam Blinkinsop. The version to be tested this time uses both a different economy and a different auction mechanism. In totally unscientific fashion, everything is a little bit different than the version that everybody enjoyed at Spielbany last Fall. bigger targets. Can you contribute to each progressive heist? Now I'm embarrassed that my restaurant game doesn't have a catchier name.